It's bad enough the federal government's official budget deficit has topped $1 trillion for the second year in a row, according to the just-released June 2010 Monthly Treasury Statement. But, focusing only on receipts for the moment, a closer look makes it obvious that the situation is even worse than it appears. Don't expect the establishment press to take any interest in the annoying but revealing details that follow. Through the first nine months of the current budget year, government revenues have totaled $1.6 trillion, up 0.5 percent from the same period a year ago. Every major component except corporate income taxes is down substantially. But it's the last item that deserves some attention. 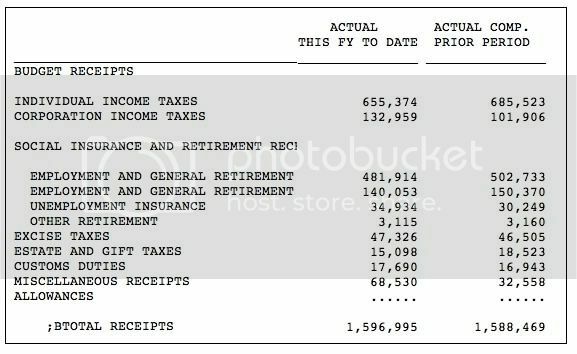 What are these "miscellaneous receipts," and why are they up by so much (take them away, and year-to-date receipts have declined by about 1.8%). Answer: Over $54 billion of it is from the Federal Reserve. As best I can tell, it represents dividends and interest on TARP lending and investments. This component of miscellaneous receipts is up by a factor of about 2.7 from fiscal 2009's comparable year-to-date amount of $19.9 billion. So the only reason receipts are up is that the Fed got into the direct lending and investment business. Tax collections that are indicators of the health of the overall economy are still down from last year, which was in turn down about 18% from the same period in fiscal 2008. That's not much comfort, is it?